The following list provides the free open source SCADA software. License: Creative Commons Attribution-ShareAlike 4.0 International License. The OpenPLC Project tries to be exactly what its name states. It is a standard industrial controller, with sturdy hardware and real time response. It can be programmed with all the five standard PLC languages (ST, IL, SFC, FBD and Ladder), making it compatible with programs written for other PLCs. OpenAPC is an Open Source APC (Advanced Process Control) solution that is highly flexible and configurable and covers a wide range of automation, visualization and process control tasks from home control up to industrial automation. It consists of several sub-components that are specialised for different tasks. Here the ControlRoom software package covers the visualisation and process control part of the OpenAPC package. openSCADA is an open source Supervisory Control And Data Acquisition System. It is platform independent and based on a modern system design that provides security and flexibility at the same time. Proview is probably the first Open Source system for process control and automation in the world. Originally developed in Sweden by Mandator and SSAB Oxelösund as a process control system based on standard computers, the system has become a fully-fledged, integrated and low-cost solution that is running on standard PC’s with Linux as operating system. Scada-LTS is an Open Source, web-based, multi-platform solution for building your own SCADA (Supervisory Control and Data Acquisiton) system. It includes everything you need to get started in a few minutes: Communication Protocols, the data acquisition engine, Alarms & Events, HMI Builder and much more. Free SCADA provides for end-users flexible tools for visualization and interactive control of any industrial process. A small footprint SCADA system entirely developed in C and C++ with multiple OS support and multiple front end protocol drivers. OpenDAX is an open source, modular, data acquisition and control system. S.E.E.R. 2 is a full featured SCADA / Historian / Aggregate Analysis System developed to work as a ‘front end’ for mod_openopc. SZARP is a full-featured, open source SCADA system for Linux. Client programs are available for Linux and Windows. IGSS FREE50 is a free edition (released March 2016) that is a full-featured SCADA System. 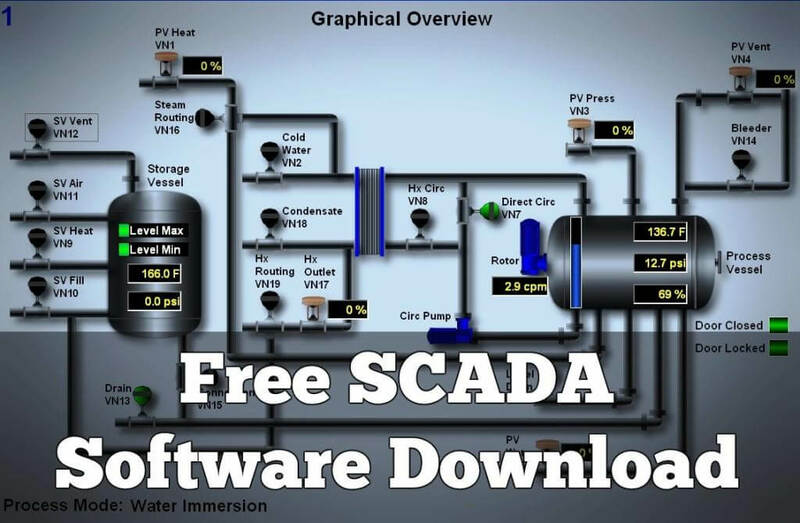 This free SCADA software has the same full functionality but is limited to setting up a project with 50 objects. You can also share any open source SCADA softwares (via comments) which are missed in the above list. OSHMI – Open Substation HMI is a modern HTML5 open source SCADA HMI designed for substation local and remote control. The server runs on Windows or Linux machines. It uses the excellent Inkscape+SAGE SVG graphics editor. Sir, I am Siddhartha from West Bengal, have bought a laptop of OS Windows 10. But here in our company all the softwares (Schneider electric’s Unity Pro and Siemens wincc) are of old version, supported in Windows 7. So, I am facing so many problem. Please help me to solve my problem. SCADA wincc software supported in Windows 10. Hi, Download links are already mentioned, please check.